Bonding and veneers are two different types of cosmetic dental restorations that transform your teeth's appearance by changing their shape and/or color. Bonding is when a tooth-colored resin (plastic material) is applied to a tooth to improve its appearance. Bonding is a pretty simple procedure. The tooth will be prepped by slightly roughening the surface. The roughened surface will help the bonding material adhere to the tooth. Next, the tooth-colored resin is placed. The resin starts out as a putty-like material, allowing Dr. Seneczko to mold and smooth it until the desired shape is reached. A curing light is then used to harden the material; it is now "bonded" to the tooth. Finishing touches are made so the bonding matches the remaining tooth surface. 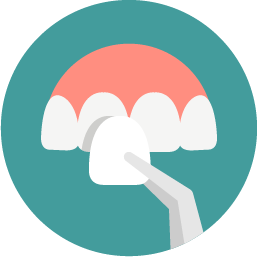 Veneers are a custom-made, wafer-thin, tooth-colored shell that covers the front of a tooth or multiple teeth. The preparation is quite simple. Dr. Seneczko will remove less than 1mm of enamel from the front surface of the tooth. An impression is then taken and will be sent to our lab, where the veneer will be made. Often a temporary veneer is not needed. The lab typically takes about two weeks to create the veneer. Once the two weeks is up you will return to the office, where the veneer will be permanently cemented to the tooth. When choosing the cosmetic procedure that is most appropriate for you, it is best to schedule a consultation with Dr. Seneczko. She can discuss in detail the pros and cons of each option so you can make an educated decision.